Here’s a run down of down of our findings over the last year. It doesn’t make for great viewing, but at least we are out there finding and rectifying this stuff. The post may seem a little light hearted but all of the below are serious issues needing addressed. 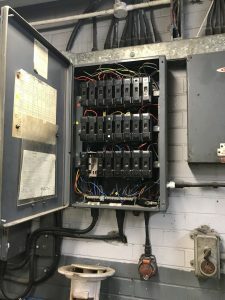 If you need any help with regards to electrical compliance please get in touch. FCS are here to help businesses and their staff stay safe. No.1 – LOOSE WIRES START FIRES. An old one but a good one. 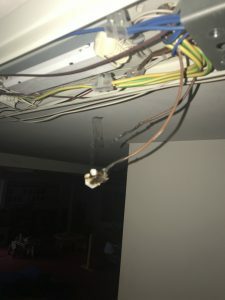 Loose wires really do start fires. When connections aren’t tightened properly or become loose we get what’s called an arc. This arc can cause temperature rise and in serious cases sparks and then fire. A thorough test and inspection may pick up this issue before it becomes critical. Over 50% of UK domestic fires last year were caused by electrical equipment or appliances. No.2 – EXCESS COPPER? THATS NOT PROPER. 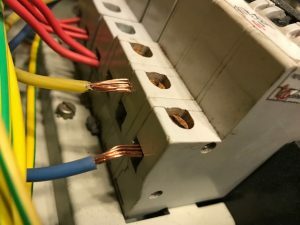 Below is the worst case we have found to date of excess copper within a distribution board. 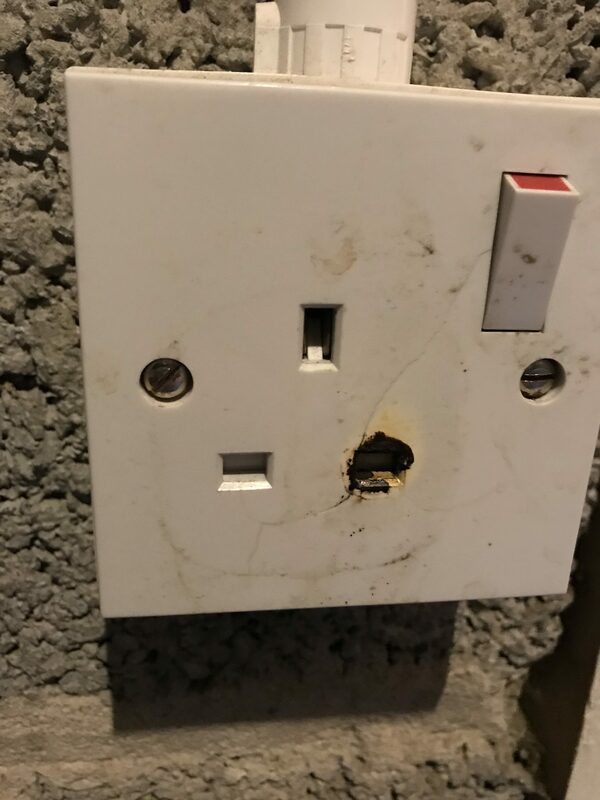 If you can see exposed bare copper anywhere in your electrical installation call a competent electrician to fix the issue. Exposed cables or busbars are highly dangerous and you should be protected from contact. No.3 – JUST BECAUSE IT GLOWS, DOESNT MEAN IT GOES. This wouldn’t be an FCS post without the inclusion of emergency lighting (the boss loves it). Emergency lighting is a critical life safety system but is often overlooked. Many sites we attend have little to no paperwork and no one seems to have responsibility for maintenance. Just because you have a green glowing led does NOT mean the system is ok. In the case below the lamps have been removed at some stage. We wouldn’t fancy getting out In an emergency with these about. 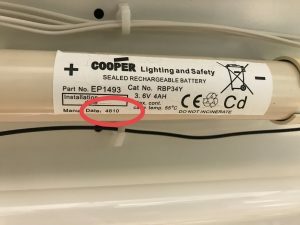 No.4 – BEFORE ITS TO LATE, CHECK THE BATTERY DATE. Another bug bearer of ours are battery dates. From our findings haswe are coming across batteries up to 16 years old still in service. Manufacturers generally state 3 to 4 years for a battery lifespan, however some can stay in service up to 6 or 7 years and still work ok. The below photo shows a battery dated 2010 still in service – it lasted approx. 30 seconds, not the prescribed 3 hours. No.5 – REMOVE SOME FRUSTRATION WITH SAFE ISOLATION. The photo below was passed to us by our friends at B&F Boyd. Not a set up, not staged. Just a perfect example of what not to do. 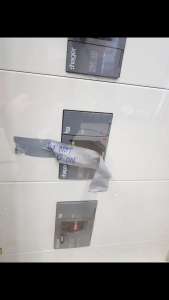 The MCCB has been isolated and a piece of electrical tape has been put in place stating ‘do not switch on’. However as you can see the tape has started to peel off. 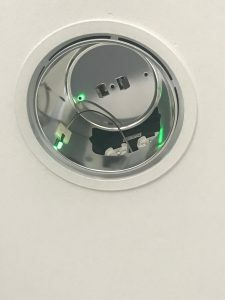 If working around electricity it is best to use a lock off tag off system whereby the MCCB is mechanically locked off using a special kit and padlock. Ensure to keep the key in your pocket rather than hanging in the lock!! 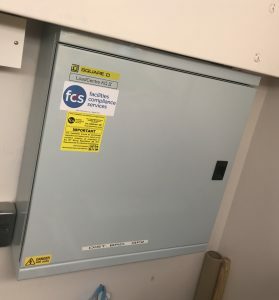 Additional protection by means of an RCD is required for certain circuits as defined in current version of BS7671, however in older installations these were not a requirement. If you have an old installation with no RCD for additional protection it may be worth a conversation to gauge risk to persons or livestock. All businesses have a duty of care to ensure safety of employees and the public alike. Regular testing and inspection of electrical systems is the only way to document the installation in terms of safety. The interval between tests is decided at the discretion of the inspector, however guidance note 3 gives us an indication of general periods. All businesses and homes rely heavily on electricity to power them, why not avoid unwanted outages by keeping your compliance up to date. If you would like any further information regarding these or any other electrical issues you may have, please feel free to get in contact. FCS are here to help.